The Whirlpool brand, maker of the Cabrio model, is a leader in washer and dryer sales in the United States. However, as with any appliance, there can be problems and a need for repairs. When your Cabrio stops working, Whirlpool offers troubleshooting tips online along with other product information. You can call a technician and pay for a repair call and parts, or try your hand at repairing it yourself. Many problems are simple to diagnose and can be repaired with just a few tools and some easy instructions. Problem: Washer is making loud noises. If the noise is a loud thumping, the load is probably unbalanced. Stop the cycle and redistribute the wet laundry. You may need to remove some pieces if the washer was overloaded. If there is a clanging noise, the washer is not leveled or grounded on the floor. This should be corrected immediately to prevent additional damage. A high-pitched whine means that you will need to do a bit of exploring inside the washer. Find a repair manual or diagram of the internal workings of the washer on the Whirlpool site. Remove the outer housing of the washer and check the nut that holds the pulley in place. You may need to simply tighten the nut. If that does not work, the bearings will need to be replaced. Problem: The start button on the control panel is not working but the rest of the lights are coming on. Remove the control panel to diagnose the problem. To help you remove the control panel, you should consult a repair manual. Check for any loose or broken pieces. Sometimes a small piece of plastic will break off behind the start button and prevent it from working. Check all the wiring with a voltage meter. Unfortunately, if the timer/main controller/CCU has failed, the entire control panel will have to be replaced. Problem: Washer lid locks but then unlocks so that cycles won't begin. The lid latch/switch will not engage if it is dirty and is not making good contact to signal the washer to begin a cycle. Dip a cotton swab in isopropyl rubbing alcohol. Clean all contact areas on the lid and the washer. Try unplugging the washer to allow the control panel to reset. Plug the washer back in and see if the problem resolves. Put the machine in standby mode by plugging it in with all indicators off, or with only the Clothes Clean or Done indicator on. Select any one button except POWER, START, or STOP then follow the steps below, using the same button. All indicators on the console will be lit for 5 seconds with 88 showing in the Estimated Time Remaining two-digit display to indicate that the diagnostic mode has been entered successfully. If indicators do not display as described, the press/hold and release procedure may not have been performed within the time frame necessary for successful entry. Repeat the procedure and you may use another button to ensure this was not the cause. The program then checks for saved fault codes. After the diagnostic test, you can compare the error code displayed to determine what repairs are needed. Problem: LD Error Code appears during the spin cycle. The "LD" error code refers to long drain. The washer stops because it is taking too long to drain out the water. This is usually caused by a clog in the drain line or something obstructing the pump. Clean out any lint or obstruction (coin, small button) that is clogging the pump filter. Turn off the water connections. Unhook the drain line from the back of the washer (keep a bucket handy to catch spills). Use a long brush or forceful stream of water to clean the line. If these steps don't solve the problem, the washer's water pump may need to be replaced. Problem: Washer leaves white deposits on clothes even with different detergents. If the deposits only occur in the winter months, the problem may be that a powdered detergent is not dissolving completely in the exceptionally cold water. Switch to a warm water temperature cycle. If the deposits occur frequently, it's time to clean your washer. 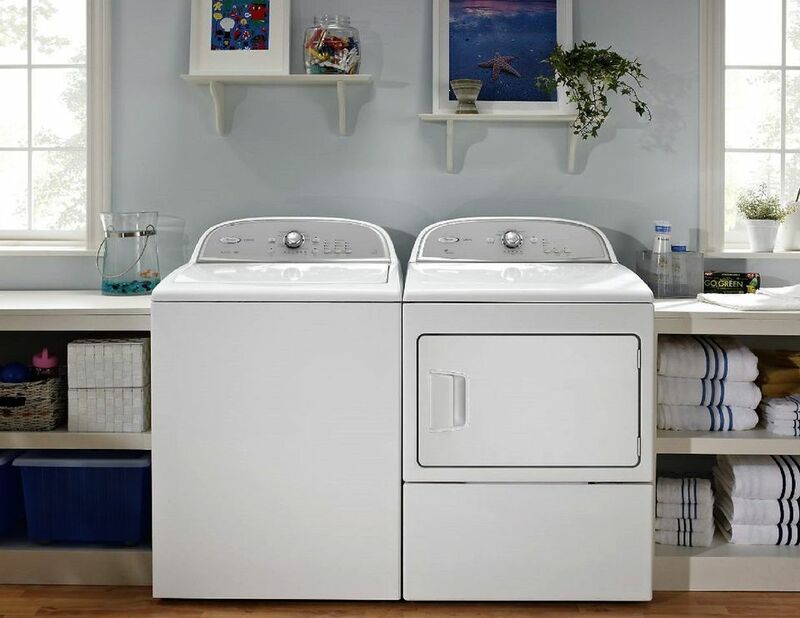 One of the downsides of high-efficiency washers versus standard washers is that there isn't a huge amount of water to flush away detergent and soil residue that clings to the washer. Think of it as the soap scum that can accumulate in the shower. You must clean the washer to get rid of the accumulation that is redepositing on your laundry. A burning odor cannot be ignored. Unplug the washer and open up the outer housing. Look for any discoloration. It is quite possible that the problem is the rubber drive belt. If the belt slips, stretches, or breaks, it can cause friction and a burning smell, most likely a burning "rubber" smell. The belt should be replaced. If the belt looks fine, there is probably an electrical problem with the motor, transmission, or control panel. This is a much more extensive problem and will require replacement of the burned out components. In either situation, do not use the washer until you have made repairs to avoid a hazardous fire. Problem: Rust spots on the inside of the Cabrio Washer Lid. Rust spots never go away. They only get bigger unless they are corrected and can transfer rust stains to laundry. Start by removing as much of the rust growth as possible with a paste of baking soda and distilled white vinegar or lemon juice. Mix one-fourth cup baking soda with just enough vinegar or lemon juice to make a thick paste. Apply the paste over the rusted area and then use a soft cloth to rub away any loose rust particles. You may need to do this several times, rinsing with clear water after each treatment. Once all of the loose rust is removed, repair the rusted areas with an appliance paint following the product directions. What Do These Flashing Numbers on My Whirlpool Washer Mean?